I don't quite remember how I came across it (possibly following a link from a search engine or Pinterest), but there's this site called The CSI Project. They hold weekly challenges with a theme they announce beforehand. You submit a project from your blog to the challenge via a link and a guest judge will choose a winner at the end of the week. I think it's great to participate in it once in a while just to break away from what's normally being done. No worry for it to come out "perfect", no pressure to make it a little interesting, just a crafting craft break. I came across the site as they were announcing the winners for their Slow Cooker Challenge and just in time for their Hardware Inspired Challenge. I couldn't get to the hardware store, but I did the next best thing: tools section of the house. 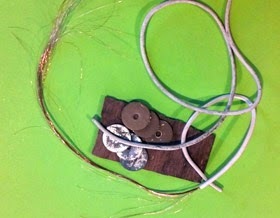 I dug up some old washers, cut off a piece of a wood panel, and grabbed some wiring from the electrical basket. First thing I tackled was the scrap piece of wood. I wanted to do that first because I wasn't sure if I could get anything from it. Grabbing all the material and trying to cut the piece of wood I had a flashback of this wooden block my father made for my mom when I was a baby. 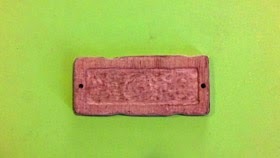 It was just a block of wood with spaces cut out leaving the remaining pieces to spell out their names. A sort of reverse engraving. There's a name for that, but right now it escapes me. After working my Dremel on it and some sanding, I got a nice uneven shape which I liked. Once I was satisfied with the plaque piece, I sanded and painted the washers. While I waited for the different coats to dry, I grabbed my work glove (yes...glove...singular....I lost the other one and haven't replaced it) along with the wire stripper and started pulling the copper wire out of the cable. I noticed that not all of the copper wire inside was the same. The first one I pulled out was nice and copper-y while the second set looked a little more used. I have no idea why because it was all covered, but I liked the whole rough look to it. 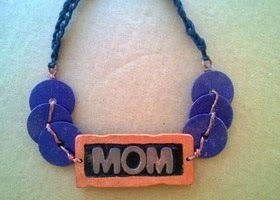 I cut out some polymer clay letters which I covered in pigment powders (I'm a new mom so lately I've been liking anything mommy-ish), threaded the copper wire through the washers, and used lace cord to hand crochet the neck piece. I missed the Hardware Challenge deadline literally by minutes, but it was so much fun. that I decided to share it here anyways. Next week they have a Knockoff Challenge and maybe I can make it in time for that one. 0 comments on "Hardware Store"